Hello everyone: One of the things I enjoy most about the Retro Rubber challenge is that one of the requirements is to for us to use our old, retired stamps, to dust them up, bring them out from obscurity and give them a chance to shine again. This card was made with one of those beautiful SU sets called Peaceful Petals, sadly retired but still, much loved. Here is the card I made for this challenge. I stamped the flowers and colored them with the Aqua Painter and SU markers, I heat embossed the centers with gold glitter embossing powder to give a bit of lift, I hope you can see it in this picture. My butterfly was stamped with one of the images of Papillon Potpourri and colored also with SU markers then punched out with the Elegant Butterfly Punch . The seam bind ribbon and the die cut foliage are also retired SU items, I love those pretty leaves. I want to thank you for visiting and for your comments, I appreciate every word you write. I hope also you liked this card, please let me know if you have any questions about it, I would love to answer them. Hello everyone: I love Vellum, don't use if often but, when I do, I always like how it makes everything look so soft and ethereal. My dear friend Darlene De Vries has a challenge for us over at her blog LiveLoveCards for the month of June and she asked us to make cards using Vellum. Here is the card I made for this challenge, it's a bit different than other cards, specially because I've never done this technique before. Here is my card. Ok, this Vellum is a bit thicker than other, more transparent Vellum sheets and that is because it has to withstand the pressure of the stylus to change the color of the paper. I've seen this technique many times but I never actually give it a try until now. I even went ahead and purchased a beginner's kit to give it a try. The designs on this kit are not to complicated, but there are other patterns out there that are simply stunning. Here is a close up of the pretty little daisy. It's amazing how a simple design changes before your eyes, I'm so totally fascinated by this beautiful and ancient art that originated in Europe back in the 15th. and 16th. Centuries. One thing I need to say about this technique is that, unlike water coloring (which is my favorite medium), this is not forgiving at all, once you apply the pressure with the stylus, the lines on the Vellum are permanent, you just can't "erase" them at all, but I can also tell you that it's fun and the results can be awesome. This card is simple and, amazingly enough, it didn't take long to finish, I think the slow part is to draw the image with the white gel pen, (included in the kit) from the images in the instruction booklet, you just place your Vellum on top of the image and trace it. I hope you like my card, I was going to leave it with no colors but I decided to paint the petals and the steam with my Prismacolor Pencils. The butterfly was stamped with one of the images of Papillon Potpourri and traced onto the Vellum, finished with the stylus and punched out with the Elegant Butterfly punch. I want to thank you so much for visiting, reading your comments truly make me so happy. If you have any questions about this card please let me know. Hello again every one: Seems to me, I've been posting on my blog a lot, I'm having a lot of fun even if I've encountered a few bumps on the road. I have a simple card to share with you for this week's Mojo Monday sketch challenge. Yesterday, it rained like crazy, so much that the emergency sirens were bowing loud and clear the warnings for flash flooding, today it's still cloudy but I was able to take this picture of my card when the sun was hitting my work desk. This pretty clay containers are from Our Daily Bread designs and it's called You are the Potter , I love this images, they remind me of our Spring Brake vacations with our grandchildren when we went to The Canyon Lands in Utah some years ago. I stamped the clay pots on water color paper and colored with SU markers and the aqua painter, this is all I use for water coloring. The cross stitched band was punched with the retired Punch Border Dotted Scalloped Ribbon and I cross stitched with some linen thread. The DSP and CS are from my stash. I chose to turn the design on it's side to fit this image, I hope it's ok. Here is the banner that inspired this card. As always, I want to thank you so much for visiting my blog, reading your comments truly make me so very happy. If you have any questions, please do not hesitate to ask. Till next time, many hugs. 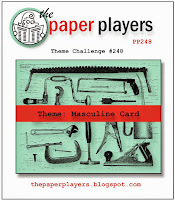 Hello everyone: I've been having some computer troubles, I don't even know if this post will get published today but, hoping for the best, here I am once again with a card I made for The Paper Players masculine card challenge. Last Friday, my first SU order arrived, in it was a stamp set I fell in love with immediately after I saw it on the new catalog. This stamp set is called The Wilderness Awaits and each of this images is stunning in their detail. I picked the majestic male deer image for my card and I added some free hand background of snow topped mountains and trees. For the snow on the mountain's top, I painted it with SU white craft ink and heat embossed it with white embossing powder, then I sponged a bit of Basic Black to give a bit of dimension, continuing down with a light sponging of Lost Lagoon and Wild Wasabi. The trees were done with an old sea sponge with a bit of Wild Wasabi ink. I didn't want to add much to this image, it's just so beautiful on it's own. I just framed it with some dark brown CS on top of a heat embossed panel done with the Hardwood background stamp and clear embossing powder. I stamped the Happy Father's Day with the Teeny Tiny Wishes using the Stamp-a-majig to fit it into the die cut label. Here is the challenge banner that inspired this card. 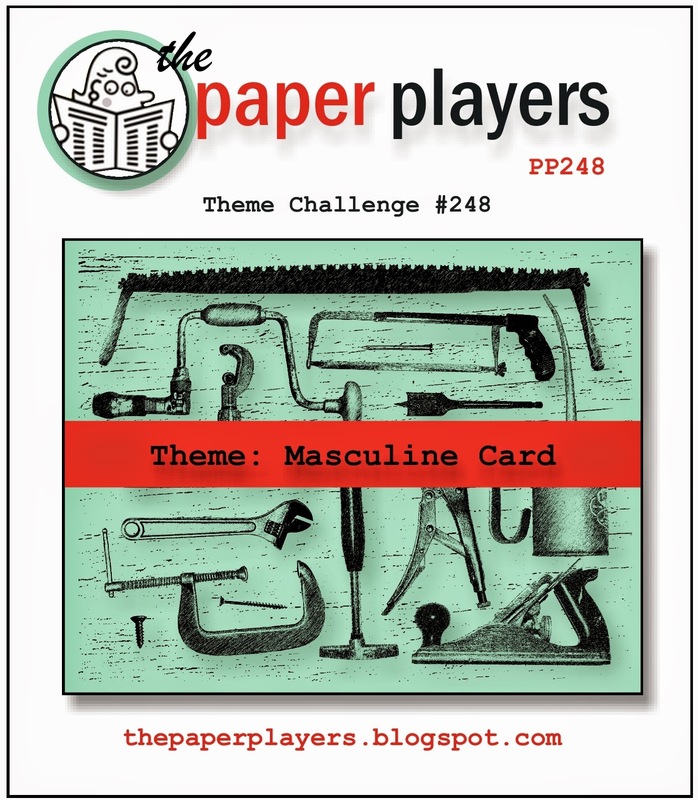 It's a challenge in itself for me to make masculine cards so I hope you like my take on The Paper Players challenge for this week. I truly appreciate your visit and your comments, this means the world to me. If you have a question, please don't hesitate to ask.